Shilla (57 B.C. - A.D. 935), reached the peak of power and prosperity in the middle of the eighth century. It attempted to establish an ideal Buddhist country and constructed the Sokkuram Grotto shrine and Pulguksa temple with splendorous masonic art. Extensive printing of Buddhist scripture was undertaken with wood blocks. The oldest imprint of the Sharani sutra, probably printed between 706 and 751, was brought to light during the recent restoration of a three-story pagoda at Pulguksa temple. 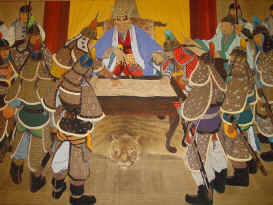 The nobility of Koguryo and Paekche were treated with some generosity. Scholars specializing in diplomatic correspondence, medicine, mathematics, and astronomy were invited to bring professional personnel into government service. The distribution of chongjon (equity land system) was put into practice in 722 for the peasants, and the people in the country then became eligible to cultivate allotted lands. In addition, reservoirs were erected for rice field irrigation. For the allotted land the peasants had to return in kind crops of rice, millet, barley and wheat. Taxation in kind was collected in accordance with the actual crops from the land. In addition, the peasants were bound to plant mulberry trees for silkworms, and walnut and pine nut trees as a side tax to the government and nobility. They raised cattle and horses, two to four head in each household. The Shilla people enjoyed an affluent life. The capital city prospered and there were street of more than 10 km distance. During this period, a prominent monk, Wonhyo (617-686) started a new sect of Buddhism among the common people. By his creative thinking, Buddhism was brought to the public as a popular religion. There was no more war in the eighth century and the desire for learning grew. Idu, a new transcription system of Korean words by the use of Chinese characters, was invented by Shilla scholars of the mid-upper class next to the upper-royal nobility, or Chin-gol (true bone). The growing need for scholarly work necessitated the recruitment of mid-upper scholars, so a quasi-civil service examination system was instituted in 788 to meet this end. The state cult of Buddhism began to deteriorate as the nobility indulged in easy and luxurious lives. Buddhism began to establish a new Son sect (generally known in the West by its Japanese name Zen) in the remote mountain area. In the cities, the state cult also encountered difficulties as conflict among the nobility in outlying districts intensified, and the throne continued to lose power as struggles within the Chin-gol clan also increased. King Hyegong was assassinated in 780. During this time, there were frequent, but futile, attempts to usurp the throne. In the outlying areas there also were uprisings initiated by Chin-gol magistrates. King Aijang was killed by his uncle who succeeded to the throne. Thus Shilla in the ninth century was shaken by intra-clan conflict both around the throne and in district administration. Chang Po-go, a successful merchant, held sway in maritime commerce in the ninth century and Ch'songhaejin (Wando), transporting goods to and from Chinese and Japanese ports. He was one among many local leaders to rebel against the Shilla throne. The government prohibited the building of new temples and extravagant decorations altogether in 806. One of the many prominent scholars, Ch'oe Ch'i-won, who had passed the Tang civil examination and drafted a manifesto against Huang Tsao, returned to his own home country. However, his suggestions were not taken seriously, nor put in practice. Although offered a high-ranking office, Ch'oe retreated to Haeinsa temple to live as a hermit. Scholars and talented persons from the mid-upper class wished for a change from Shilla's rule.